Play Crazy Birds™ online for free now! 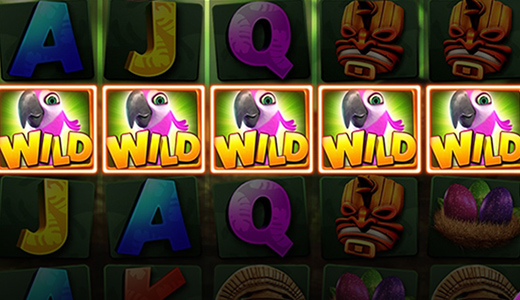 In Crazy Birds™ you play on 40 win lines that extend across 5 reels. The Gold Coin and the Relic symbol achieve the highest winnings. The aim with Crazy Birds™ is to line up five identical symbols on as many win lines as possible. The symbols on the win lines have to run from left to right. The Wild symbol (Candy) substitutes for any other symbol in this game. The Pool Party and Free Spins symbols are exempt from this. When the Pool Party symbols form a square on reels 1 and 2 measuring 2 x 2, the Pool Party feature is triggered. When the Free Spins symbols form a square on reels 4 and 5 measuring 2 x 2, free spins are triggered. Potty can appear during each spin and conjure up more Candy (Wild) symbols. If you don't earn a win following a spin, then the Rocky symbol can appear at any time and smash non-winning combos with his wings. Afterwards, you will receive a guaranteed win which will also be smashed until you achieve no more winnings. Then the regular game continues. With a little luck the Loopy symbol is also there for you after an unsuccessful spin. He summons a prize wheel with the following winning options: Cash win, guaranteed win spin, Pool Party feature and Free Spins feature. In the Pool Party feature you can initially select either Potty, Rocky or Loopy. The chosen bird symbol slides down all 3 pools and collects a win per pool. Furthermore, with a little luck there is the option of another bird doing sliding down the pools for you. The Free Spins feature comes with 5 free spins. These can be extended anytime by another Free Spin a 2x2 square on reels 4 and 5. If one or several Wild symbols land during the free spins, then Candy bestows further Wild symbols on you. 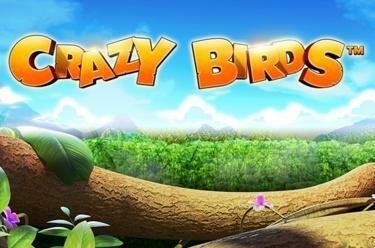 In Crazy Birds™ you enter the world of Potty, Rocky, Loopy and Candy. These nutty birds will make your gaming experience a helluva lot more fun! While the male contestants are competing for the heart of the beautiful Candy, loads of Twists my flow into your waiting hands. From cool pool parties to exciting free spins: this slot has a lot in store for you! So, what are you waiting for? Have a ball at the island of love birds!